While the sub-9-inchers tablets are fighting over in the other post, over here is a match between the high-rollers – the 10″ tablets. 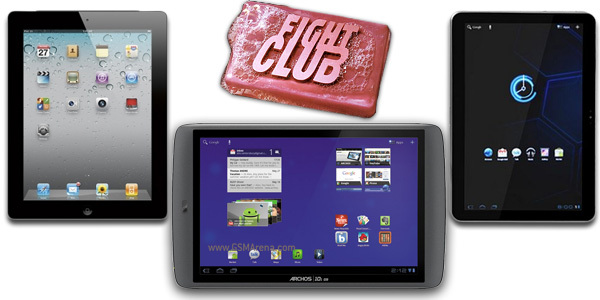 The newcomer, the Archos 101 G9 tablet, is the main interest here as it takes on the Samsung Galaxy Tab 10.1 and the Apple iPad 2. While those two stick to 1GHz dual-core CPUs, the Archos shoots for the top with two 1.5GHz cores. The Archos 101 G9 is also offering an unusual 250GB HDD version, but that adds quite a bit of thickness and weight and, I’m guessing, is a real battery drain. Still, the 101 G9 has some goodies like (gasp!) a standard USB port plus a miniHDMI port, while both the Galaxy Tab 10.1 and the iPad 2 use a proprietary port. Despite boasting such impressive specs, the Archos 101 G9 is surprisingly modest in price. The Archos 101 G9 looks pretty good. We don’t know a few things about it though – like RAM amount or battery capacity. But if you can wait until September, the 101 G9 will be one of the best tablets in terms of bang for the buck.